The age old-battle of Disneyland vs Disney World. How are Disney’s two American theme parks similar, different, and which is better? Get ready to rumble! Disneyland and Disney World are often lumped together despite being on different coasts. It is true that are both resorts are operated by The Walt Disney Company and share many similarities in terms of themes, attractions, and other uniquely “Disney” park experiences. But to say these two iconic resorts are nearly identical is a gross generalization. Disneyland and Disney World have an almost entirely different set of histories, characteristics, attractions, resorts, shows, transportation, dining locations, and other experiences. While both parks possess the “magic” that makes a Disney destination so special, each of these parks has its own unique advantages and disadvantages. Here we present you with a Disneyland vs Disney World comparison to help you sort out the differences between these two iconic Disney vacation destinations. Disneyland was opened to the public in 1955 as the first Disney theme park. This Anaheim, California amusement park was the only Disney park to open under the direct supervision of Walt Disney while he was alive. The resort is located in a developed urban environment and covers 300 acres with no room for expansion. It’s home to two theme parks and three themed on-property resorts. Disneyland is regarded as a great destination for shorter vacations and for families with younger children. Walt Disney World opened its first theme park – Magic Kingdom – in 1971, five years after Walt Disney’s death. It’s located in Lake Buena Vista, Florida and stretches across roughly 43 square miles (w/ room for expansion). Disney World is home to four theme parks, two water parks (Blizzard Beach and Typhoon Lagoon), five golf courses, and over 25 themed resorts. Walt Disney World Resort regarded as an ideal destination for extended visits and is enjoyed by children, families, adults, groups, and business convention-goers alike. As a general rule, you can both Disneyland and Disney World to experience peak crowds during school holidays like Thanksgiving, Christmas, summer vacation, spring break, and on the weekends. The park can also be crowded during special events (like the Epcot International Food and Wine Festival) and when a new area, land, or attraction opens (like Toy Story Land or Star Wars Galaxy’s Edge). See our Disney Crowd Calendar and Disneyland Crowd Calendar pages for guidance. Line wait times tend to be longer at Disney World as compared to those of Disneyland. Although it varies from day to day and attraction to attraction, most guests have found wait times to be roughly 10-20 minutes longer at Disney World due to the sheer number of visitors. That said, Disney World’s version of the Fastpass system is widely considered to be more efficient. Disney World’s FastPass+ system allows you to reserve three rides ahead of time to essentially bypass the normal lines and breeze onto the rides you have selected. You will also have the opportunity to add additional ride reservations after you’ve used your three Fastpass+ selections. Disneyland uses a different type of FastPass system which does not allow you to reserve rides ahead of your visit. However, you can buy the MaxPass feature (for an extra $10 per person per day) in order to reserve a ride time on a ride-by-ride basis. Disneyland’s Fastpass – and even the MaxPass system – end up being less efficient and an inferior ride queue system than Disney World’s FastPass+. Both Disneyland and Disney World offer several ticket options, including discounts for multi-day tickets. Disneyland offers single-day tickets to Disneyland Park or Disneyland California Adventure Park (in the range of $117), with children ages 3 to 9 at a slightly reduced rate, and kids under 3 get in free. Disney World’s single-day adult admission prices are slightly higher (in the range of $119). Disneyland guests can choose to purchase tickets to a single park or both parks. Disney World offers a single-day ticket to a particular park (i.e., an Epcot single day ticket), but multi-day tickets do not distinguish between which theme parks guests may visit. Disney World also offers a Park Hopper option, allowing you to navigate between theme parks as you wish. Disney World has a ticketing process called MyMagic+ which bundles together just about every aspect of your trip to make life easier. Guests receive a MagicBand rubber bracelet equipped with a computer chip that accesses all of the guest’s information – room key, theme park ticket, dining reservations, PhotoPass+, etc. Guests also receive FastPass+, a system which can be managed from your smartphone and allows you to skip lines at the attractions you select. Disneyland is a much simpler vacation to plan due to its small size. There is no MagicBand system at Disneyland. The official Disneyland app allows you to purchase your tickets, view attraction wait times, browse maps, check show times, and more. Disneyland has its own basic Fastpass system and premium MaxPass system. Guests are issued a Key to the Magic card. This is used to charge meals and merchandise, access the hotel room, and enter the parks. Disneyland and Disney World each have a number of on-property resort hotels. Disneyland has three: Disney’s Paradise Pier, the Disneyland Hotel, and the Disney’s Grand Californian Hotel, the flagship resort. Walt Disney World has over two dozen resort hotels which are grouped according to price and offerings: Disney Value Resorts, Disney Moderate Resorts, and Disney Deluxe Resorts. The Grand Floridian Resort and Spa is Disney World’s elegant flagship resort. There are also a number of non-Disney owned resorts within Disney World, and several within walking distance to Disneyland. Guests staying at any Disney World resort receive a number of perks, including the ability to participate in Extra Magic Hours, extended time at a designated theme park beyond normal operating hours. Disneyland does not participate in Extra Magic Hours. Because of its larger size, Disney World has a lot more dining options and character dining experiences. This is not to say that Disneyland is lacking in this area because they are plenty of restaurants and character meals here as well. In fact, both parks have a wide assortment of table service dining, quick service meals, and snack bars in the theme parks, resorts, and shopping districts. Disney also does a wonderful job with accommodating those with special dietary restrictions like vegetarians and those with gluten and allergy needs. See our Magic Kingdom Restaurants, Epcot Restaurants, Animal Kingdom Restaurants, and Hollywood Studios Restaurants pages for Disney World dining recommendations. Winner: Disneyland’s food is delicious, but there is more variety and dining locations at Disney World. Disney World comes out on top. Disneyland’s smaller size allows for more walking between the resorts, parks, and Downtown Disney. The entrance gates to both theme parks are right across from each other and anyone staying at one of the on-property hotels will be able to walk to the Downtown Disney District and to the park entrances. There is a monorail transportation system within the park. Disney World covers a much larger area and is not as conducive to walking. However, the resort has an excellent complimentary transportation system to take you anywhere you wish to go. 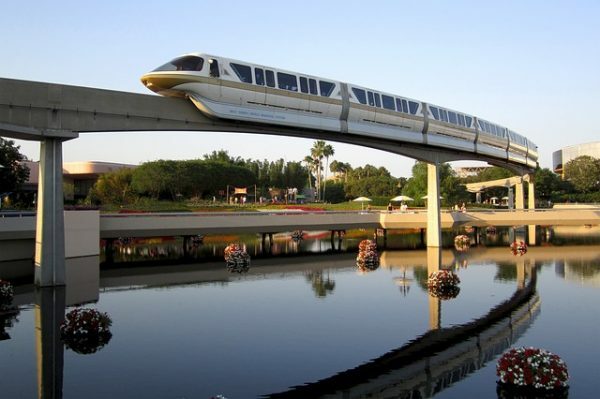 Traveling between resorts and theme parks generally requires a 10 to 30-minute ride via bus, ferry, or monorail. Traveling between resorts or to Disney Springs may require a transfer, but every resort has some form of transportation directly to the theme parks. See our Disney Transportation Map for more information. 8. Attractions, Roller Coasters, Rides, Etc. There are roughly 20 overlapping attractions at Disneyland and Disney World. These include Pirates of the Caribbean, Space Mountain, and It’s a Small World. Despite having the same themes, each ride has its own variation on the theme so that they are not completely identical. Disney World has the most one-of-a-kind rides, including the popular Kilimanjaro Safaris, the Seven Dwarfs Mine Train, Spaceship Earth, Mission: SPACE, and much more. Disneyland’s one-of-a-kind rides include Mickey’s Fun Wheel, Matterhorn Bobsleds, Radiator Springs Racers, and the Finding Nemo Submarine Voyage. There are 6 six big roller coasters at Disneyland: Space Mountain, Big Thunder Mountain Railroad, Goofy children’s coasters, Matterhorn, California Screamin’, and Gadget’s Go Coaster. Disney World has five major roller coasters including Space Mountain, Big Thunder Mountain Railroad, Goofy children’s coasters, Expedition: Everest, and The Rock ‘n’ Roller Coaster. Disneyland is known for its dark rides which take riders into a well-known Disney story. These include Mr. Toad’s Wild Ride, Alice in Wonderland, Pinocchio’s Daring Journey, Roger Rabbit’s Car Toon Spin. Disneyland and Disney World both host a few of the same shows: Fantasmic!, Turtle Talk with Crush, and It’s Tough to be a Bug. Disneyland lays claim to a few unique shows including Frozen — Live at the Hyperion, the World of Color, and Main Street Electrical Parade (formally at Disney World). Walt Disney World is the only park to host Monsters Inc. Laugh Floor, Mickey’s PhilharMagic, Beauty and the Beast – Live on Stage, and Finding Nemo – The Musical. Be sure to check out our list of the best live shows and musicals at Disney World for some ideas. Disneyland vs Disney World – So Which Resort is Best? So how do these two iconic Disney parks stack up against each other? You really can’t go wrong with either one. Both Disneyland and Disney World have some similar experiences and others that are completely unique to one another. Each park has its pros and cons, but you really can’t go wrong with either one. Disneyland is very compact, whereas Disney World is sprawling. As such, Disneyland is more manageable for walking. There are even some off-site hotels within walking distance. Southern California has more of an ideal climate for a theme park with less rain and stable, warm weather. Disneyland lays claim to some great features (Car Land, for example), and some attractions which are now absent from Disney World (Mr. Toad’s Wild Ride and Snow White’s Scary Adventures). Disneyland’s smaller size puts it at a disadvantage for a few reasons. With just two theme parks, Disneyland has fewer attractions and rides to chose from. There are just three on-site hotels and fewer restaurants than Disney World. Plus, the themes are just not as interesting as those of Disney World. We also think Disneyland’s FastPass/MaxPass system is inferior to Disney World’s FastPass+ system. Disney World wins in terms of park variety (4 theme parks, 2 water parks), dining options and character meals, FastPass+ system, Extra Magic Hours (something Disneyland doesn’t offer), shows, events, and atmosphere. By “atmosphere,” we mean that each section of Disney World just feels like a world unto its own. The parks, resorts, and dining experiences each have their own distinctive character and themes. We may be generalizing, but everything feels extra magical at Disney World! Because Disney World is so spread out, walking can become tiresome and Disney transportation can be time-consuming. The buses, monorails, and ferries are very efficient, but to get from Point A to Point B does take a sizable chuck out of your day. And pray that the skies stay clear because the rain, storms, and summer heat are known to put a damper Disney vacations. Disney World vacations do tend to be more expensive than Disneyland vacations, so consider searching for discounts and deals or, better yet, contact a Disney Travel Planner to assist you with every step of your planning and booking process. We love both Disneyland and Disney World. The answer to “which Disney park is better” really comes down to personal preference. However, our favorite is clearly Disney World because it captures that special Disney magic like no other place in the world. Try both parks and see which one you like better! We hope that our Disneyland versus Disney World comparison page was helpful in deciding which Disney resort is better. For more helpful Disney World vacation information, check our Disney Travel Agents, Disney Dining Plan Calculator, Disney World for Adults, and all our other pages. If you need help planning your trip to Walt Disney World, please contact our friends at The Vacationeer to help you plan and book your trip. We are here to help you plan the most magical Disney vacation possible.